Our Company Brand Cotton Shirt is the perfect business gift to ensure staff promote your brand name and logo with full exposure! Customise your business freebie shirt with a large range of colours and have a 'screen' print of your brand name and logo on the surface of the shirt. Being 100% cotton its durable and will outlast other clothing in the wardrobe. 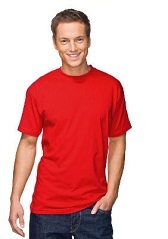 Ensure you personalise your Company Brand Cotton Shirt today and gain some retention with your promotional clothing!